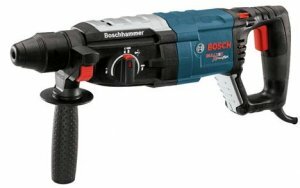 More power usually means more vibration, and less vibration usually means less power; but Bosch was able to produce a rotary hammer with a drilling capacity of 1-1/8-inch while also including actual active vibration reduction. Most rotary hammers in this class only use materials that help absorb vibration, but Bosch took the same active vibration reducing technology from their larger Combination Hammer and applied it to the smaller RH228VC. What is really unique about the RH228VC is that it offers 20% more power (2.4 ft-lbs), but uses less BPM's (0-5,460). Bosch says they are able to gain power by using a longer piston that strikes harder. The lower BPM is also said to reduce wear on the 8-amp motor. Other features that help set the RH228VC apart include a patented 45-degree pivoting cord turret, a Vario-Lock SDS-Plus chuck that allows the user to rotate chisel bits to match their working position, and a HammerHook system that can be used to hang the drill on some near-by lumber. The Bosch RH228VC is available now in stores for around $260. It is about $100 more than other rotary hammers in its class, which is due to the added costs of active vibration reduction.